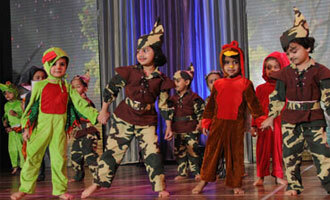 MET Rishikul Vidyalaya organised pre – primary Annual Day Celebration ‘Anandvan' on March 02, 2012. In keeping with the timeless traditions, curtains of Anandvan 2012 opened to seek the blessings of the Almighty with an invocation vocal by Sr. Kg. children, devoted to Lord Ganesha.